These are the Plumlee Brothers, Miles, Mason, and Marshall. I told them that Mrs. Steiner wanted me to take the picture. Let me explain a little bit about how this all happened. My mom was the elementary school librarian for the Plumlee brothers that play basketball for Duke. 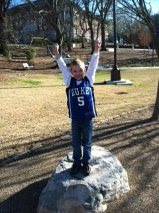 Recently, my mom emailed Mason a picture of Carter in his #5 Duke Jersey (Mason's number) that he got for Christmas. Since Duke was playing at Clemson, my mom asked about tickets and we were lucky enough get tickets to the game... After a great day of basketball, Carter was waiting for autographs after the game. Carter got to meet Mason Plumbee. He signed Carter's Duke backboard and his jersey. Marshall and Miles came out too. They were all so nice to us and we were so thankful for the chance to go to the game. It was amazing. Now back to the game. Here are a ton of pictures. If you couldn't notice. We are sitting on row B, right behind the bench. They were the best seats possible. Miles #21, Mason #5 and Marshall to the far right. Waiting before the game. We were able to watch from above as the player's bus arrived. You can see Miles in the front, Marshall with the gold headphones and Mason in the back with the blond hair. Before the game, we looked around the Clemson fans. 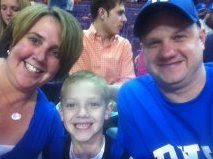 Patrick and Carter are actually Clemson fans, except when Duke is playing, so we enjoyed looking around. We had a great time and are so thankful for my mom and the Plumlees for making this happen... Carter was overwhelmed at times, but keeps taking about it all the time. Abby stayed with Nana and Gramps and had a good time getting her nails painted and being spoiled. We left the day after Christmas to drive to Indiana. We decided that driving straight to my moms would be the plan. The kids really did great for the 13 hour drive, other than we realized that Abby gets a little car sick in the mountains. We were busy with a lot of fun things at my mom's house. Here are some of the pictures to tell you about our trip. We opened presents the morning after we got there. Everyone got fun presents and Aunt Amy was also there to celebrate with Carter and Abby. Carter got a Mason Plumlee #5 Jersey from Grandma. It was so cool and he wore it all the time, especially when he was shooting baskets in his over the door Duke hoop. He loves all of his Duke stuff Abby really just loves opening presents right now. We caught her trying to peak and guess what was inside this year. Then we went outside to play in the snow and play we did. Riding on sleds behind the 4-wheeler. Riding on the toy snowmobile that I got when I was very young. I get it out for the kids each year and have posed pictures of them sitting on it, even if there was not snow. Thank goodness, there was snow this year. The kids loved the dogs this year so much. They were always playing with them, holding their collars and walking them or just petting them. It was so sweet. Abby did Grandma's hair. Grammie read books to Carter. Aunt Amy helped Abby line up her princess dolls for breakfast and Tinkerbell would fly in to deliver breakfast. Everyone needs an awesome Aunt Amy. Meaghan and her family came. Here is London, her youngest. Abby enjoyed giving her a bottle and kept rubbing her head. 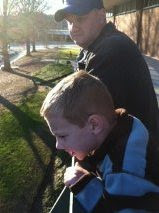 Carter and Chip are a year apart, but are best buddies and just love being together. Kelly and I are pretty sure that if we lived closer they would be together all of the time. All of our kids... Getting so big. We also had fun shopping a little in Warsaw, running errands, visiting with mom's friend Marj, and her family and really just letting the kids be kids at my moms. Abby is getting an interesting personality and she sings all of the time... Carter is growing up but has such a tender heart. We left my mom's on New Year's Day as Carter has to be back at school tomorrow so we decided that since the kids were still doing so good, we would drive the whole way back. We hope that everyone had a wonderful holiday season. I am going to try and post some pictures of Christmas day. We will see.